Before the 57th Street supertall boom began, the corridor had relatively few icons. But among those few, Sheldon Solow’s 9 West 57th Street stands as one of the most monumental buildings in all of Midtown, and also one of the most expensive. Now, the developer is building a smaller residential tower next door, at 7 West 57th Street, and the project’s designers, Hill West Architects, have sent along a rendering of what it will soon look like. As YIMBY reported when new building permits were filed back in January, the structure will rise 19 floors and 237 feet to its rooftop, translating into relatively generous ceiling heights. Within, there will be 32,099 square feet of residential space, divided amongst 16 units, which will average just over 2,000 square feet apiece — a sure sign of condominiums. There will also be 4,100 square feet of retail space on the first two floors, and mechanicals on the third floor. All of the condominiums will be full-floor units. Design-wise, the building’s short height means it won’t make any dent in the skyline. However, in terms of its relation to the streetscape, the development will be positive, with an envelope that’s mostly flush with its pre-war neighbor. The retail space will also feature high ceilings, and it appears the mechanical space on the third floor will be illuminated at night, creating an especially attractive display for passersby. For better or worse, the sloped exterior of the neighboring 9 West 57th Street has already ensured that the block’s street-wall will never be whole, though its public plazas and iconic design are a breath of fresh air that are worth the sacrifice. The new tower will replace an old brick building that was probably built in the 1800s, which has already been demolished. 7 West 57th Street was purchased by Solow for $25,550,000 back in 2005, and besides the adjacent tower at 9 West 57th Street, the developer also appears to be working on another assemblage directly across the street, having most recently closed on the $128 million purchase of 16 West 57th Street back in May of 2016. That site may eventually host a substantial residential tower of over 200,000 square feet that could potentially cross into supertall territory, though no permits have yet been filed. As for 7 West 57th Street, construction is now underway, and completion is likely by the end of 2019. 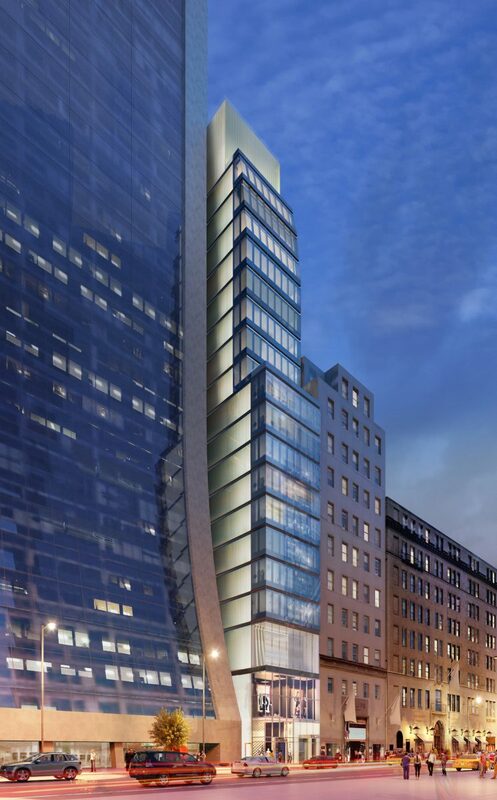 4 Comments on "Solow’s New Condominium Tower at 7 West 57th Street Revealed, Midtown"
Very positive building, moderate height and architecture. Next to Sollow one of famous modern structure in whole Midtown, sloppy monolithic glass of 9 West 57 street, who is still making tourist take a fresh look on it stop to take pictures. This jerk is knocking down tons of beautiful old buildings on 57th street without a second thought for the heritage of the city. The replacements are mediocre. Someone must put and end to this nonsense before more and more nice old buildings are destroyed.